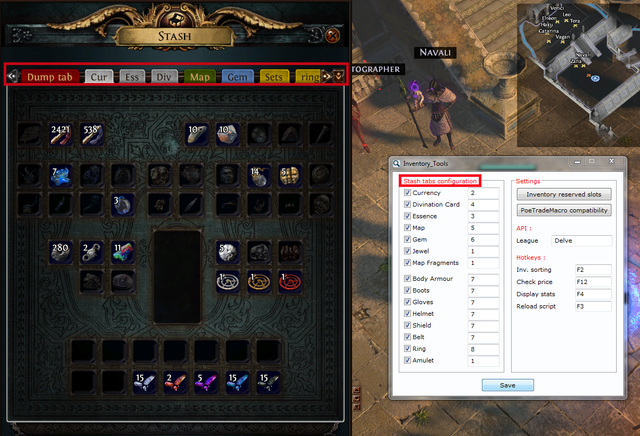 - Move items from your inventory to your stash tabs automaticaly! - Fast price check over an item in game! - Display chaos per map statistics in game! - You have to update prices database manualy each day by clicking on the menu button "Update database"
Not just a quality of life tools, but realy a huge time saver ! Last edited by raden38; 12-25-2018 at 01:39 AM. i wonder if sending keys/mouse events to the game is allowed. so this is not legal dude...stop displaying it on your stream. Clicking 1 key/button that leads to sending 1000 mouse clicks and 1000 keyboard clicks -> ban ban ban. EDIT: Other than that, really amazing work. Last edited by zaafar; 12-04-2018 at 09:54 PM. Reason: forgot something. This definitely breaks the TOS of the game. Will people get banned? Probably not unless they do something stupid like stream it. But as always, cheat with caution. Areas with corrupted side zones change the area title color. You can change this to a preload in the preload menu. iirc, their stance (and most game's stances) is that macros are okay... as long as 1 button press = 1 action. From the looks of it, you are doing more than just one action... especially if it is automated. 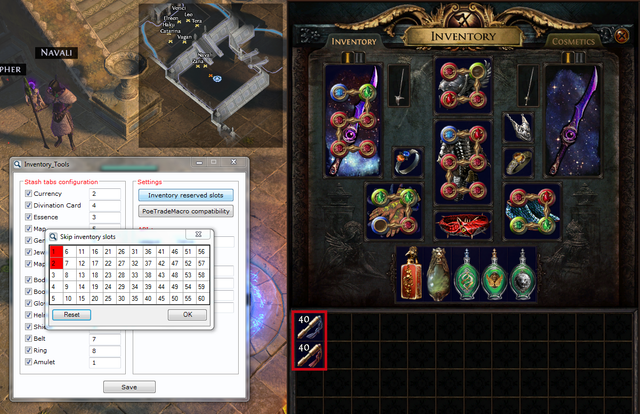 Using this COULD lead to a ban... if GGG ever decided to take action. Thanks for your advices dudes. i have edited. Hey. How does it work? I just want to know if it reads memory or something else ? Pixel read for example is undetectable, but memory read at this point is definatelly. Hello, it does not conform to the game resolution when I pressed F2 starts clicking a completely different place from my inventory! I use a resolution of 4k 3840x2160! I can't use my middle mouse click anymore after launching this. Same. I believe its pressing "C" when you use the middle mouse, tho the character screen doesnt open when using middle mouse, but if you go into the ingame settings and try to rebind middle mouse, it rebinds to "C" with the program open. Unfortunately rebinding with this method stops the program from functioning correctly. Yes the middle mouse bind was in source code for my personal use. I have made a change to fix it ! You can now download the lastest version 1.14. It work as currency item so splinters are drag & drop in your currency tab and not sacrifice tab. Combine 100 splinters to create Esh's Breachstone. How to replace spells using poe modding tools?